In a welcome move, Apple’s iOS 5.1 update included, among other features, the return of Genius Mixes and Genius Playlist for subscribers to iTunes Match. At least, in theory. Initially, we—and many others, if Apple’s support discussions are any indication—found that the Genius features either didn’t work or didn’t even appear on our iOS devices after installing the 5.1 upgrade. The Genius icon vanished for iTunes Match customers. But with iOS 5.1—and possibly a little elbow grease—you can now get it back. Genius, which builds a playlist full of songs that you are likely in the mood to hear based on the initial song you select, and Genius Mixes, which algorithmically assemble mixes of your music based on Apple-identified commonalities, would at first glance seem to be perfect companions to Apple’s $25-per-year service for storing your music in iCloud. But, when iTunes Match first launched, customers discovered that enabling it on their iOS devices caused the two Genius options to vanish. Then along came iOS 5.1, whose release notes stated (in part) that the update included “Genius Mixes and Genius playlists for iTunes Match subscribers.” iTunes Match subscribers the world over—or at least the two of us—rushed to install the update for that feature alone. But, that update didn’t immediately deliver on its promise. For one thing, Genius Mixes, which used to occupy a space on the toolbar in the iPhone’s Music app, were nowhere to be found. 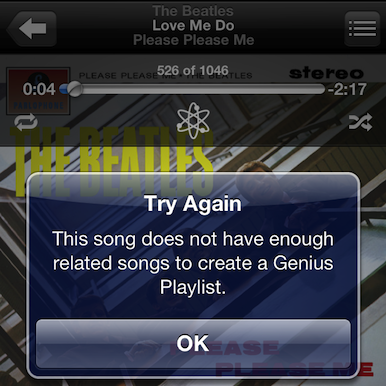 Initially, this error was all that the Genius icon could make happen on iOS 5.1 for iTunes Match customers. We suspect the issue may have had something to do with Apple’s servers for Match and/or Genius as opposed to the iOS itself. As of this writing, the Genius playlist and Genius Mixes features appear to once again be working correctly for both of us, although we needed to leverage a carefully implemented, scientifically sound fix first—one that didn’t work before Friday. That fix? We turned iTunes Match off and then on again on our iOS devices a few times. The iTunes Match toggle in Settings -> Music. To turn iTunes Match off, visit the Settings app and tap on Music. There, slide the iTunes Match slider to the Off position. (While you’re there, note with mild intrigue that iTunes Match now has its own Use Cellular Data option, which toggles whether iTunes Match can download music when only a cellular network is available. It’s totally independent from the Use Cellular Data option for iTunes in the Cloud, which controls whether your purchases of Music, Apps, and Books made elsewhere are automatically downloaded to this iOS device.) As an added precaution, switch to the Music app, and wait for all your iTunes Match-sourced playlists to vanish. Once they have, return to Settings -> Music, and turn iTunes Match back on. The off-again, on-again Genius Mixes icon. Now, hop back over to Music once more, and try out the two Genius features. Does the Genius icon successfully trigger the creation of a Genius playlist? Do you see the Genius Mixes option? (If you’re not sure where to look for that one: It’s under the More tab on the iPhone; on the iPad, Genius Mixes appear first under the Playlists tab.) If both Genius features are working, your work—and ours—is done. If not, repeat the steps outlined above once more—turn iTunes Match off, wait till the Music app is empty, and then turn iTunes Match on again. (You can skip the noting with mild intrigue step on this and any successive run-throughs.) In our experience, it took a handful of tries for the features to finally show up and, in some cases, it can be helpful to force quit the Music app. To do so, double click the device’s Home button, tap and hold on the Music app in the multitasking bar, then tap the red minus icon that appears in the top left corner so the icon disappears. Macworld spoke to Apple about the Genius-related iTunes Match users early in the week, and the company indicated that it was investigating our report. At this time, we haven’t gotten official word from Cupertino regarding what went wrong initially, or why toggling iTunes Match off and on a few times may be necessary for some customers to reactivate Genius functionality.